Low-income seniors, lower-income veterans with special needs, as well as veterans experiencing homelessness may be able to move into The Beacon by late 2019, a supportive housing development being built on the corner of Long Beach Boulevard and Anaheim Street. Today, the City of Long Beach, in partnership with the Long Beach Community Investment Company (LBCIC) and Century Housing Corporation, celebrated the groundbreaking of The Beacon, which will include two buildings with 160 units of affordable housing. The buildings will mark the completion of the final phase of the site development, that includes the adjacent 161-unit Long Beach Senior Arts Colony and the 39-unit Annex. Those who benefit from the expanded housing options will also be able to use comprehensive supportive services that will connect residents to job centers and amenities helping them achieve and maintain independence, said Ronald Griffith, CEO of Century Housing, which finances affordable housing developments in California, including the Century Villages at Cabrillo. 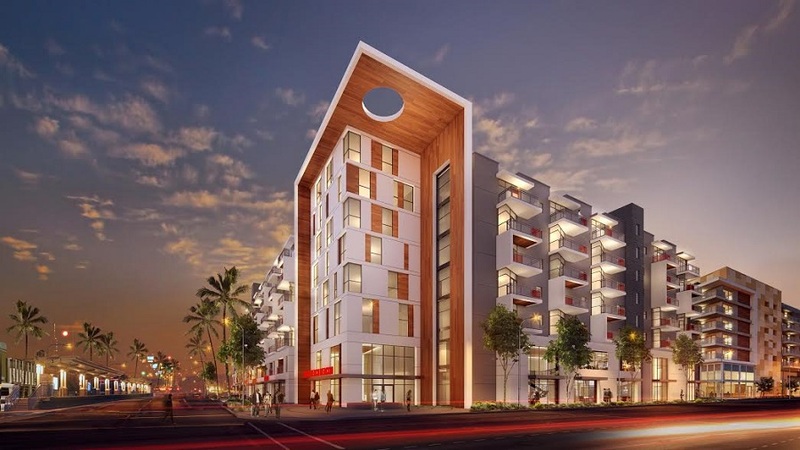 Located at 1235 Long Beach Boulevard, the development includes two buildings: the seven-story Beacon Pointe which will have 120 units reserved for low-income seniors and the five-story Beacon Place which will provide 38 units for lower-income veterans with special needs and homeless veterans or veterans at risk of experiencing homelessness. The development is oriented across the street from the Metro Blue Line light rail and bus lines that operate along both Long Beach Boulevard and East Anaheim Street. Rendering courtesy of the City of Long Beach. In January, the LBCIC approved more than $12 million in funding for the development. The Beacon is one of five developments to use new state certificated low-income housing tax credits (LIHTCs) in California under a three-year pilot program. Rents will be subsidized through project-based Section 8 Vouchers for all 158 restricted units, which will provide approximately $822,000 annually, according to the city. A loan from The LBCIC. A Veterans Housing and Homelessness Prevention Program (VHHP) loan through CalVet and the California Department of Housing and Community Development (HCD). Two Affordable Housing Program (AHP) loans through the Federal Home Loan Bank. A grant from the Home Depot Foundation. Construction financing from Wells Fargo Bank. A permanent loan from the California Community Reinvestment Corporation (CCRC). An equity investment by Wells Fargo through an allocation of tax credits from the California Tax Credit Allocation Committee (CTCAC). For more information on the City’s affordable housing developments, visit the website here. For information on Century Housing, visit the link here. The Beacon will be located at 1235 Long Beach Boulevard.